More pesky spam on the Windows Phone Marketplace. Come on Microsoft. We're back again with more spam (or useless app deployment) rants, folks. Apologies in advance but it really tickles the annoyed spot when we come across developers who either believe it's perfectly fine to publish copyrighted content with other owned properties, or simply launch themselves on a crap-posting-spree. The last time we touched on spam itself, we were following the work of Eric_Rulz, but don't worry if you missed our coverage and investigation as his account is still present as well as the apps he produced. This is a developer who was obviously on a path to cause trouble by building and releasing apps that hold little (if any) functionality that's useful for consumers. In fact, he has an app called Spam. Unfortunately we've noticed some more extreme levels of spam, from a developer called Bhavana Khatri. As one can see there's little need for the range of apps available - unless you wish to have an app specifically dedicated to cabbage stir fry, of course. If you remember back to our previous entanglement with Eric_Rulz, Microsoft implemented measures to help prevent such instances occurring again, but it seems as though we're naked to attacks from those who have the single desire to publish a mess to the Marketplace. We're hoping this publicity will alert Microsoft at just what's going on, but do let us know in the comments if you've encountered any spam lately. 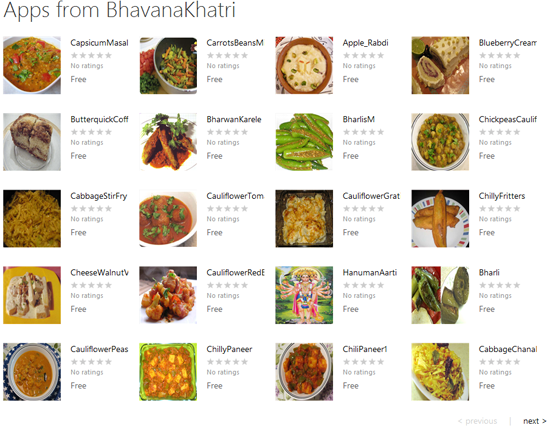 You can check out some more useful apps by Bhavana Khatri over on the Marketplace.